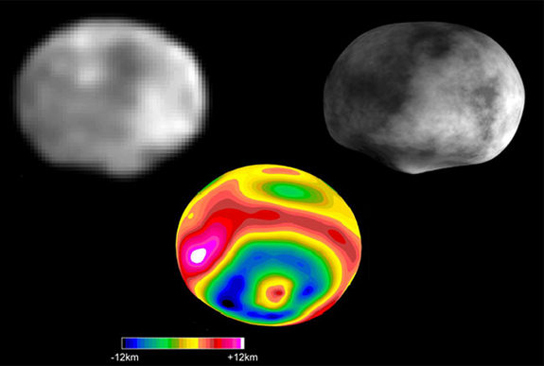 Vesta, the second most massive asteroid in the Solar System, after the dwarf planet Ceres, was thought to be a dry place, but the most recent evidence from NASA’s spacecraft Dawn has found that smaller, water-rich asteroids once implanted themselves in Vesta’s surface. The water is locked up in hydrated minerals until subsequent impacts create enough heat to melt the rock and release the water as gas. The scientists described their findings in two papers published in the journal Science (1, 2). Vesta is the brightest asteroid visible from Earth and its maximum distance from the Sun is slightly farther than the minimum distance of Ceres from the Sun (2.56AU). However its orbit lies entirely within the Cererian orbit. This is yet another body in the inner Solar System that has a water cycle. Dawn’s instruments detected an excess of hydrogen in the asteroid’s equatorial regions, that would indicate a water content as high as 400 parts per million. There are also hundreds of pits, some as deep as 200 meters, in several of the same regions, which are thought to reflect places where the heat of a subsequent impact unlocked the water content and it vented into space. Hydrated minerals have also been discovered on the moon, but a very different mechanism is responsible for it on Vesta. Dawn has now left Vesta and is heading to Ceres. It’s the biggest asteroid in the Solar System and astronomers already know that there is water there, but there might even be a subsurface, briny ocean. 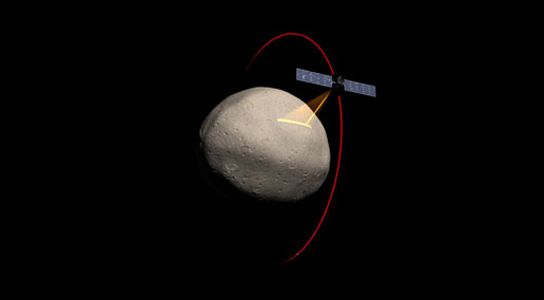 Be the first to comment on "Dawn Spacecraft Finds Traces of Water on Vesta"